I have been making this rice dish since I was a teenager and still love it every time I taste it! In fact, I love it, every time I smell it cooking! At university, living in a house with four other girls, it was my often-requested specialty. I will give you the basic recipe, that makes a terrific side-dish for everyday meals. And I'll fancy it up with some wild-rice mixed in, making it a great side-dish for dinner parties or pot-lucks. Either way, it can be served hot or at room temperature. This dish can be baked in the microwave oven or regular oven. Both take about the same time, however the microwave uses less energy, and of course, we like that. 1 cup white rice. 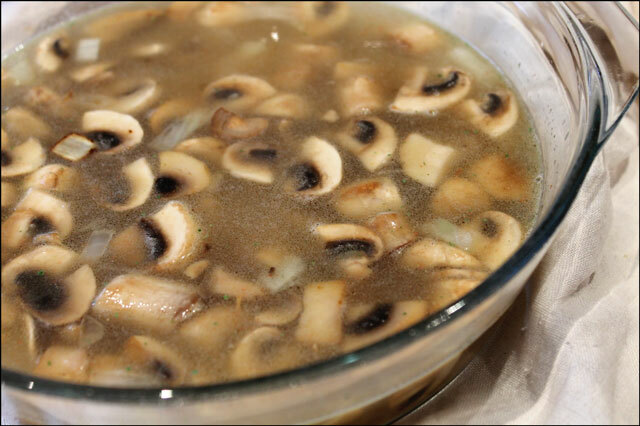 Brown can be substituted, though the texture of the finished dish will be different. 1/2 cup chopped onion (I use the large white ones but regular onions are fine). 8-10 mushrooms, cut in half and sliced thinly. 2 cups stock (I use Knorr Vegetable stock in powder form, added to water) Depending on the salt content of your broth, you might want to add extra. I add about 1/8 teaspoon more salt. If you're using your regular oven, preheat it to 350 degrees. In a heavy frying pan, heat oil and butter. 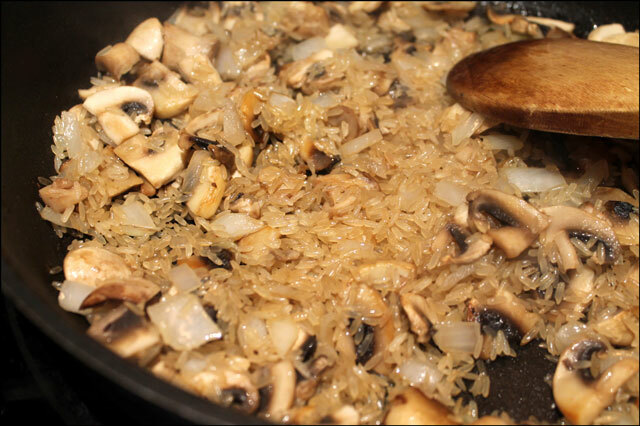 Add onion and mushrooms and saute for about 3 minutes. Add (uncooked) rice and toss around until coated. Stir and fry this mixture until rice begins to turn light brown. Transfer to a casserole dish that has a cover, keeping in mind that the rice will double in volume so you want to use one that is big enough, with some room to spare. Stir in stock and salt if using, cover and put it in the oven. If using your microwave oven, set it to 60% power. Bake for 30 - 40 minutes (in either type of oven), until the rice is tender and the liquid is absorbed. 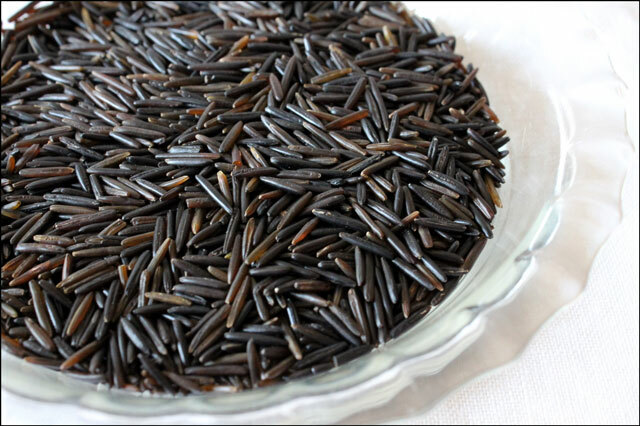 * If you're making the fancy version with wild rice, you cook the wild rice separately and add it to the dish at the end. This means you have to start earlier because wild rice should be soaked for 45 minutes to an hour before cooking. Then it is simmered gently in water for about 45 minutes to an hour, or until cooked. (It pops open when it's cooked!) Drain any extra liquid before using. 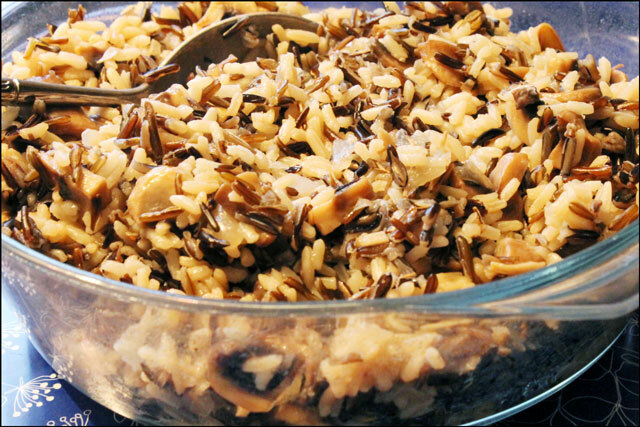 Fold the cooked wild rice into your baked rice and you have the fancy version! I was interested to learn that wild rice isn't actually rice at all. It's grass! It is grown primarily in Canada so it's readily available here, however I'm not certain how easy it is to get elsewhere. 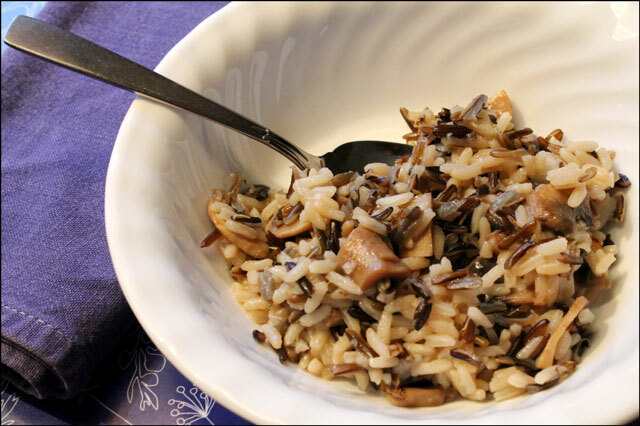 If it's unavailable to you, I apologize for teasing you with this recipe, but please be assured that the rice dish is delicious without the wild rice. Even here in Canada, wild rice is relatively expensive, which is why I like to add it in small quantities to other rice, to make it go further. Below are pictures of the wild rice addition. The first one is what it looks like uncooked. It has a bold nutty flavour that is quite 'wild' tasting. I hope you try my recipe! Perhaps it will become a favourite in your home too. that looks absolutely delish! 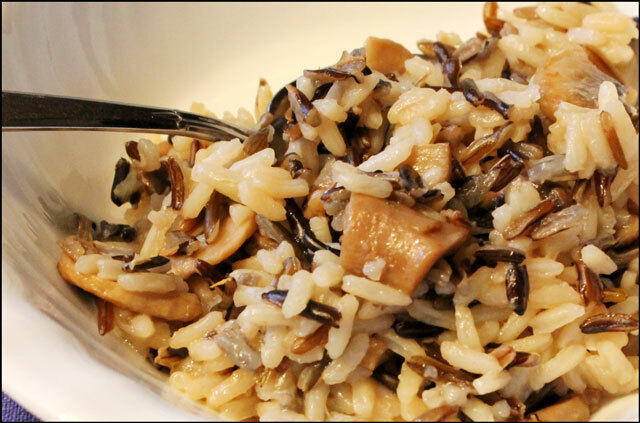 love the addition of wild rice to the recipe! This looks soooo delicious!! 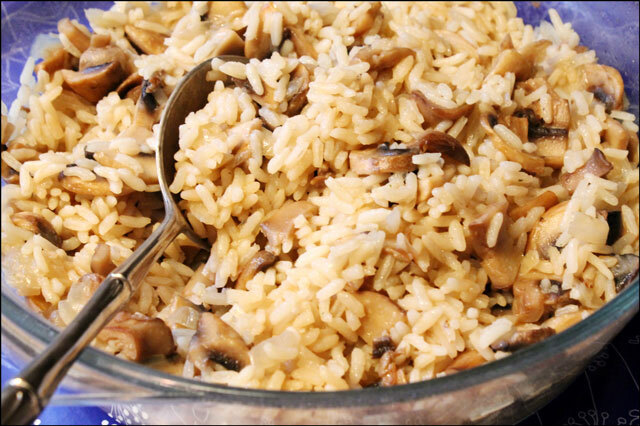 Jim and I love rice (and Jim really loves mushrooms), so I think I must try making it! Thanks for sharing! I do a similar mushroom/rice casserole but I add cottage cheese and 1 tsbp of sour cream to enhance moisture. I’m gonna yours tonight, looks delish! mmm, those sound like good additions!